To get the latest version of the Java SDK and get started developing with Java, see Get started with the Java client SDK for Azure Media Services. To download the latest PHP SDK for Media Services, look for version 0.5.7 of the Microsoft/WindowsAzure package in the Packagist repository. You can use Media Services to deliver MPEG-DASH, Smooth Streaming, and HTTP Live Streaming (HLS) streams protected with PlayReady digital rights management (DRM). 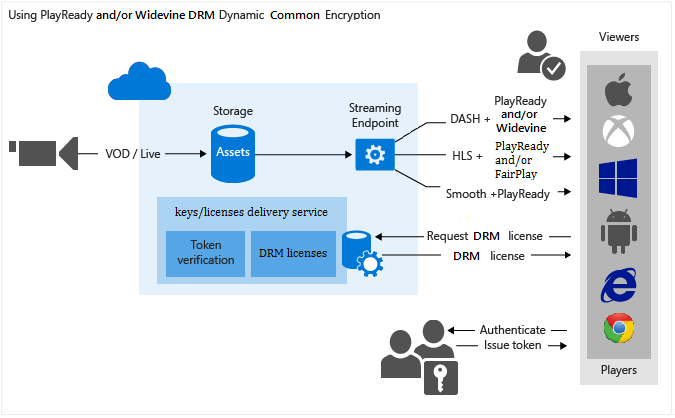 You also can deliver encrypted DASH streams with Widevine DRM licenses. Both PlayReady and Widevine are encrypted per the common encryption (ISO/IEC 23001-7 CENC) specification. You can use the Media Services .NET SDK (starting with version 3.5.1) or the REST API to configure AssetDeliveryConfiguration to use Widevine. Media Services provides a service for delivering PlayReady and Widevine DRM licenses. Media Services also provides APIs that you can use to configure the rights and restrictions that you want the PlayReady or Widevine DRM runtime to enforce when a user plays back protected content. When a user requests DRM-protected content, the player application requests a license from the Media Services license service. If the player application is authorized, the Media Services license service issues a license to the player. A PlayReady or Widevine license contains the decryption key that can be used by the client player to decrypt and stream the content. For more information, see integration with Axinom and castLabs. Media Services supports multiple ways of authorizing users who make key requests. The content key authorization policy can have one or more authorization restrictions, either open or token restrictions. The token-restricted policy must be accompanied by a token issued by a security token service (STS). Media Services supports tokens in the simple web token (SWT) and JSON Web Token (JWT) formats. For more information, see Configure the content key's authorization policy. To take advantage of dynamic encryption, you need an asset that contains a set of multi-bitrate MP4 files or multi-bitrate Smooth Streaming source files. You also need to configure the delivery policies for the asset (described later in this topic). Then, based on the format specified in the streaming URL, the on-demand streaming server ensures that the stream is delivered in the protocol you selected. As a result, you store and pay for the files in only a single storage format. Media Services builds and serves the appropriate HTTP response based on each request from a client. This article is useful to developers who work on applications that deliver media protected with multiple DRMs, such as PlayReady and Widevine. The article shows you how to configure the PlayReady license delivery service with authorization policies so that only authorized clients can receive PlayReady or Widevine licenses. It also shows how to use dynamic encryption with PlayReady or Widevine DRM over DASH. You can download the sample described in this article from Azure samples on GitHub. When you create the content key authorization policy, you must specify the delivery method (PlayReady or Widevine) and the restrictions (open or token). You also must specify information specific to the key delivery type that defines how the key is delivered to the client (PlayReady or Widevine license template). Configure the delivery policy for an asset. The delivery policy configuration includes the delivery protocol (for example, MPEG-DASH, HLS, Smooth Streaming, or all). The configuration also includes the type of dynamic encryption (for example, common encryption) and the PlayReady or Widevine license acquisition URL. You can apply a different policy to each protocol on the same asset. For example, you can apply PlayReady encryption to Smooth/DASH and an AES envelope to HLS. Any protocols that aren't defined in a delivery policy (for example, if you add a single policy that specifies only HLS as the protocol) are blocked from streaming. The exception is if you have no asset delivery policy defined at all. Then, all protocols are allowed in the clear. The remainder of this article provides detailed explanations, code examples, and links to topics that show you how to achieve the tasks previously described. If you add or update an asset delivery policy, you must delete any associated locator and create a new locator. Currently, multiple content keys aren't supported when you encrypt by using Widevine with Media Services. With dynamic encryption, you create an asset that contains a set of multi-bitrate MP4 files or multi-bitrate Smooth Streaming source files. Then, based on the specified format in the manifest and fragment request, the on-demand streaming server ensures that you receive the stream in the protocol you selected. Then, you store and pay for the files in only a single storage format. Media Services builds and serves the appropriate response based on requests from a client. For more information, see Dynamic packaging overview. Media Services supports multiple ways of authenticating users who make key requests. You must configure the content key authorization policy. The client (player) must meet the policy before the key is delivered to the client. The content key authorization policy can have one or more authorization restrictions, either open or token restrictions. The DRM license acquisition URL. The type of dynamic encryption (in this case, common encryption). There is a limit of 1 million policies for different Media Services policies (for example, for Locator policy or ContentKeyAuthorizationPolicy). If you always use the same days/access permissions, use the same policy ID. An example is policies for locators that are intended to remain in place for a long time (non-upload policies). For more information, see Manage assets and related entities with the Media Services .NET SDK. // TokenClaim.ContentKeyIdentifierClaim was specified during the creation of TokenRestrictionTemplate. // You can use the https://amsplayer.azurewebsites.net/azuremediaplayer.html player to test streams. // Note that DASH works on Internet Explorer 11 (via PlayReady), Microsoft Edge (via PlayReady), and Chrome (via Widevine). // and create an authorization policy. // Configure PlayReady and Widevine license templates. CreateAsync("Deliver Common Content Key with no restrictions"). CreateAsync("Deliver Common Content Key with token restrictions"). // and returns the XML string. //The PlayReadyLicenseResponseTemplate class represents the template for the response sent back to the end user. //(which might be useful for custom app logic) as well as a list of one or more license templates. // to be returned to end users. //enforced by the PlayReady DRM runtime when you use the content key. //or nonpersistent (held in memory only while the player uses the license). // AllowTestDevices controls whether test devices can use the license or not. // is set to 150. If false (the default), the MinimumSecurityLevel property of the license is set to 2,000. // You also can configure the PlayRight in the PlayReady license by using the PlayReadyPlayRight class. // configured in the license and on the PlayRight itself (for playback-specific policy). // any restrictions that must be put in place when you use a given output. //(analog video outputs aren't allowed to pass the content). //IMPORTANT: These types of restrictions can be very powerful but also can affect the consumer experience. // content might be unplayable on some clients. For more information, see the PlayReady Compliance Rules document. // Get the PlayReady license service URL. // GetKeyDeliveryUrl for Widevine attaches the KID to the URL. // to append /? KID =< keyId > to the end of the URL when you create the manifest. // so you need to remove the KID in the URL when you call GetKeyDeliveryUrl. // In this case, we specify only the DASH streaming protocol in the delivery policy. // All other protocols are blocked from streaming. // Add AssetDelivery Policy to the asset. // Create a 30-day read-only access policy.